Leaked images of Samsung's unannounced Jasper Android phone for Verizon surfaced earlier today. Unlike the out of focus photos that typically accompany a product leak, the Jasper image looks to be an official press shot found by @evleaks. From the image itself we can see that the Jasper, model SCH-I200, will use a row of four touch buttons under the screen rather than the central physical button Samsung adopted for its more recent handsets. In fact, the Jasper looks strikingly similar to T-Mobile's Galaxy S Blaze 4G, which launched in March. A few of the Jasper's hardware specs accompanied the image leak today. Samsung's new handset will run Android 4.0: Ice Cream Sandwich with a dual-core 1.5GHz Snapdragon MSM8960 processor. It also features a screen resolution of 800 x 480 pixels and 4G LTE support. 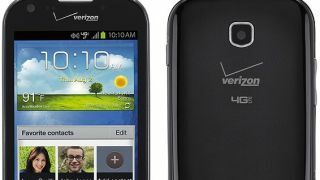 With the exception of an upgrade to an Ice Cream Sandwich OS, the Jasper's purported specs are consistent with the Galaxy S Blaze 4G. If Jasper does turn out to be a Verizon repackaging of Samsung's mid-range T-Mobile handset, then we can assume the screen is a 4-inch Super AMOLED display. It likely also features a 1.3-megapixel front camera and 5-megapixel rear lens capable of recording 720p videos. Of course we won't know for sure until Samsung confirms that the Jasper actually exists. But if clean press shots are already here, the official announcement won't be far behind.